Work is progressing real well on my test for the Six Frock Coat. 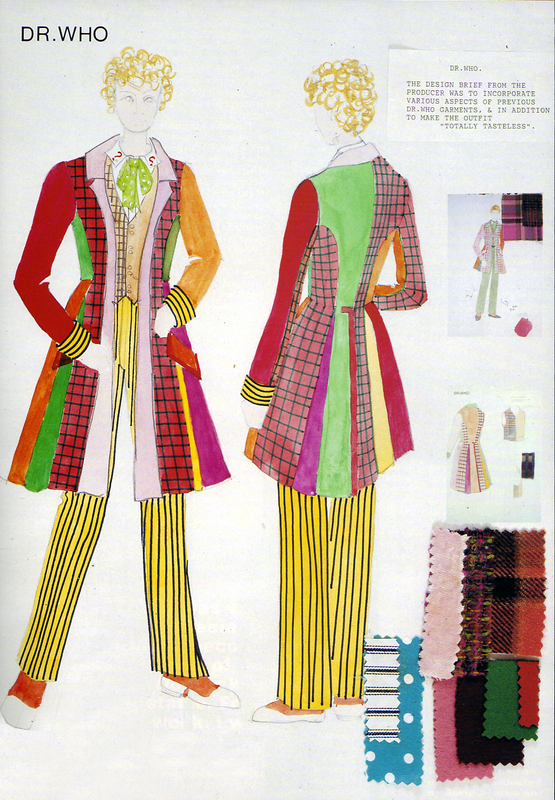 But while I am making one in a tasteful, colour co-ordinated purple, it would be a good time to pull myself back to the target colour scheme and take a look at the ORIGINAL costume design by Pat Godfrey. I love the near child-like way it is drawn, and the felt pens to block in the colour. Nothing is subtle here – as you would expect having been introduced to the costume by the finished result. Right now for me, the swatches at the bottom are the most tantalising part of the design. 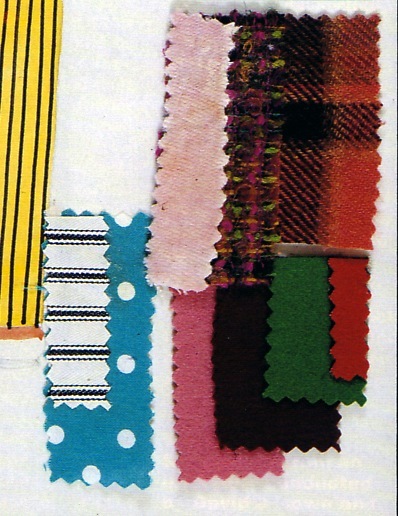 (10) Cuffs (also trousers); Turquoise Polka-dot Cravat; (11) Pink Felt; (2) Purple Felt; (3) Green Felt; (5) Red Felt. It is interesting to note that the cuff/trouser fabric is in black and white not yellow. This affirms that it had to be dyed to achieve the screen-used colour, explaining why I have never found it in a ready to use form despite searching high and low. By the looks of things the checked fabric used for the collar wasn’t originally intended to be used. the design shows both lapels and collar in the pink velvet (ironically not far off how I am doing my purple version), and the pocket flaps are red. 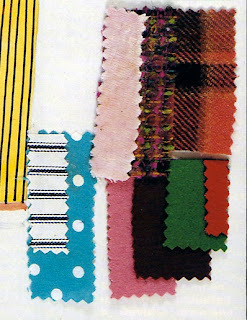 The cravat is shown to be lime-green, although the screen-used turquoise is amongst the swatches attached. But the thing that is REALLY interesting are the two alternative versions sketched at the side. One seems to show a coat with a much higher hemline – though this could just be the illustrator’s style, as a lot of fashion sketches depict stick-like figures, with exaggerated leg lengths! (see left, top). this also shows a version of the tartan in PINK! The trousers are green, as is would also appear is the cravat. The second alternative is more like the main design, but with some differing colourways for the back panel. A peachy colour seems to have been substituted for the green (see left, bottom). Next to it is the waistcoat, with a swatch of the knitted fabric for the left-hand side. Fascinating stuff, and great that it has survived all this time. Thanks for this! Did they ever create a concept sketch for Eccleston or Tennant? I like this conceptual sketches for frock drawing. I like this blog. I found it very interesting.